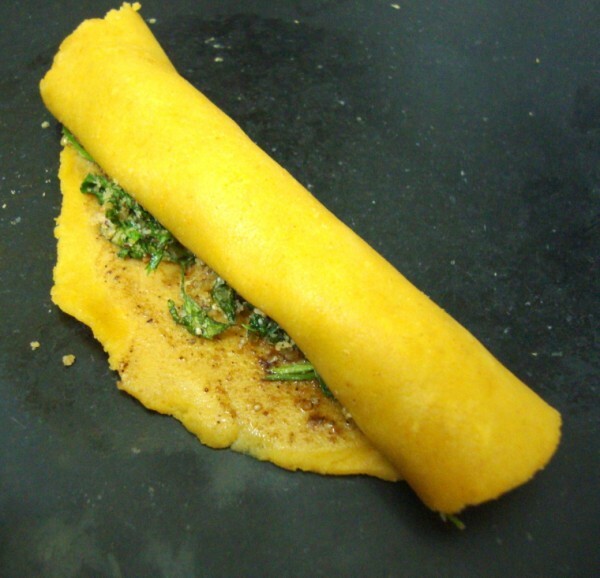 This month for Indian Cooking Challenge, I thought I should finally attempt at making Pudachi Wadi or Coriander Rolls a specialty dish from Maharashtra. The first time I heard this being discussed was in the GDM group, where I always get excited by the new things I get to know. One of the member was asking if anybody knew how to make Pudachi Wadi. Well I am not sure if anybody replied back with a recipe, I was sure curious to know what it was. A simple search on google lead me to Archana of Tried & Tested Recipes. I remembered Archana from my early years of blogging. She was a good friend with whom I interacted through email. She no longer blogs, which is very sad. She has some awesome recipes on her blog which I am sure will be a good collection of dishes from her kitchen. Reading through the recipe I knew it’s something I would love it. It was like trying to understand a new dish that must be quite famous in that cuisine. I knew coriander leaves a plenty now in the market and I wasn’t way off in procuring it now. Well I announced and quite simply forgot it as I planned to make it on 14th. Lataji pinged me weeks ago saying she tried and it turned out to be great. Slowly other members replied back with the same feedback. I was so excited and impatient to try it on my own. The ingredients are very simply, you should be having them in your pantry. Couple of the members though replied back saying Poppy seeds is not available in their place, which is sad as I replied that really adds an unique taste to the end product. The entire process gets done quite quickly and you won’t really feel it being strenuous. But I was wondering how on earth this was prepared in large quantities for a big joint family. It does require couple of more helping hands to get it done. And what I realized was I had to control not finishing it off all myself and should wait to take pictures. Lataji also referred me to Khaugiri’s Pudachi Wadi. Her post was quite clear in instructions I ended up referring her site in the end and mixing both! 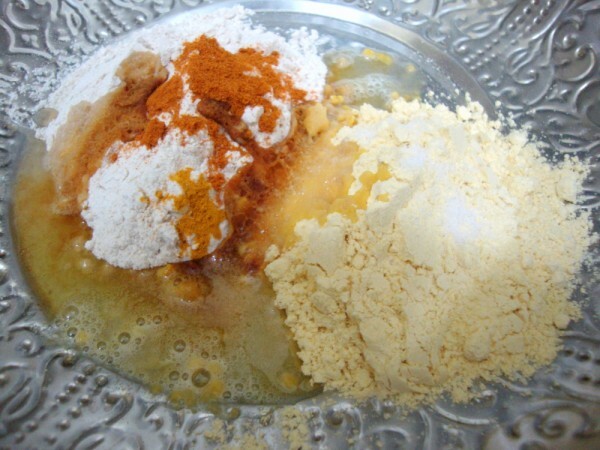 In a bowl, take the wheat flour, gram flour, Red chili powder, Turmeric powder, Salt and hot oil. 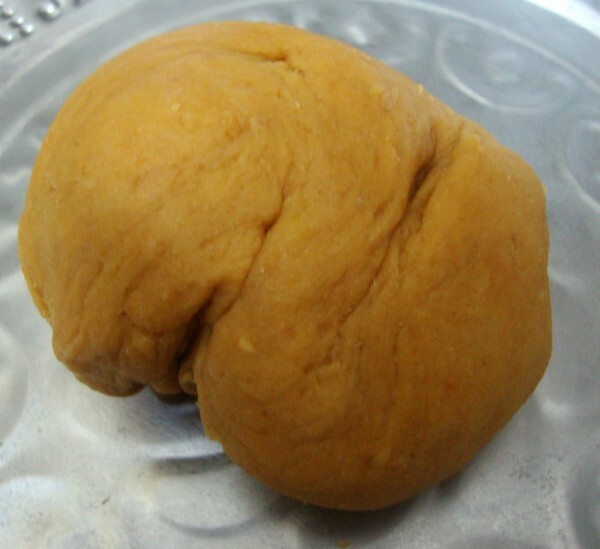 Knead to a stiff dough. Add as little water as required and let it rest aside for 30 mins. 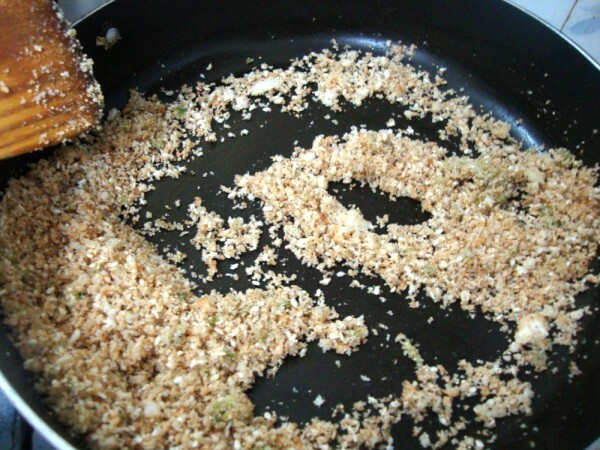 For the stuffing, heat a non stick pan with 1 tsp oil. 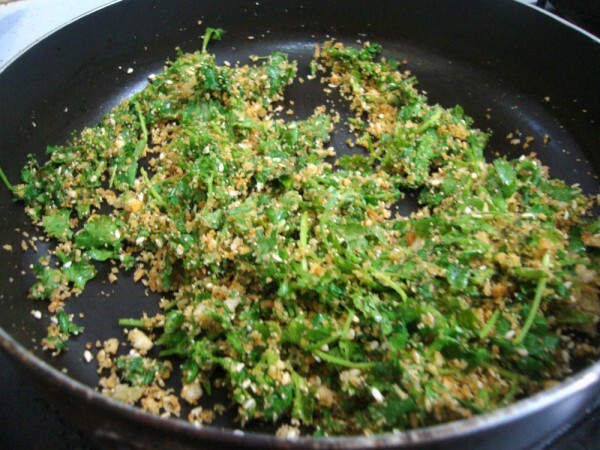 Fry the grated dry coconut, Poppy seeds, Sesame seeds, ginger-chili paste, finely chopped garlic, red chili powder, salt. Keep stirring so that the coconut doesn’t get burnt. Wash and chopped the coriander leaves finely and add to the pan, simmer for a while till the leaves are cooked. 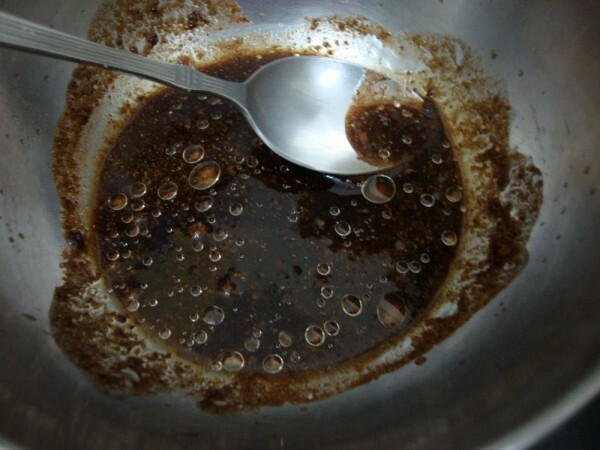 In a bowl, mix tamarind pulp, Garam Masala and oil. Keep it aside. When you are ready to make these, heat a pan with oil for deep frying. Pinch out small balls the size of a ping pong ball. 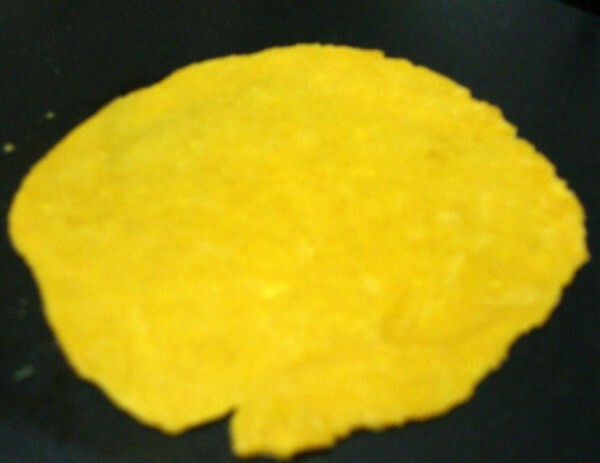 Roll out a disc not very thin or thick. Spread a spoonful of Tamarind – Garam Masala paste over it. Then tightly roll out over the stuffing and completely seal the ends. The roll will finally look like this. 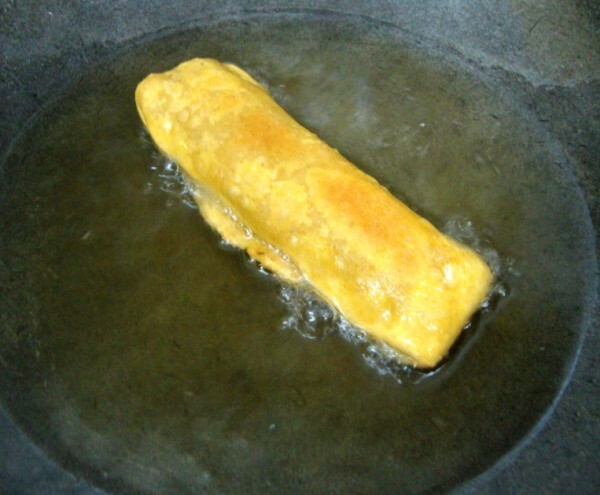 When the oil is hot, deep fry the rolls over medium flame until both sides are cooked and golden in colour. In a bowl, mix all the ingredients and with some water knead a stiff dough. Let it rest for 30 mins. This is important as the first batch that rested well came out well done. Wash and finely chop the coriander leaves. Heat a non stick pan with 1 tsp oil, add the ginger – chili paste, finely chopped garlic. Then add the dry coconut, poppy seeds, sesame seeds. salt. Keep stirring else, the coconut will get burnt. Then add the chopped coriander leaves. Cook for 2 -3 mins. When it is done, add lemon juice. In a bowl take the tamarind pulp, garam masala and oil. Mix well. Pinch out small balls the size of ping pong balls. roll out a disc the 6″. The discs should not be very thin or thick. Spread a spoonful of the paste over the disc. Then take 1 tsp of the coriander stuffing, spread it evenly on the top. 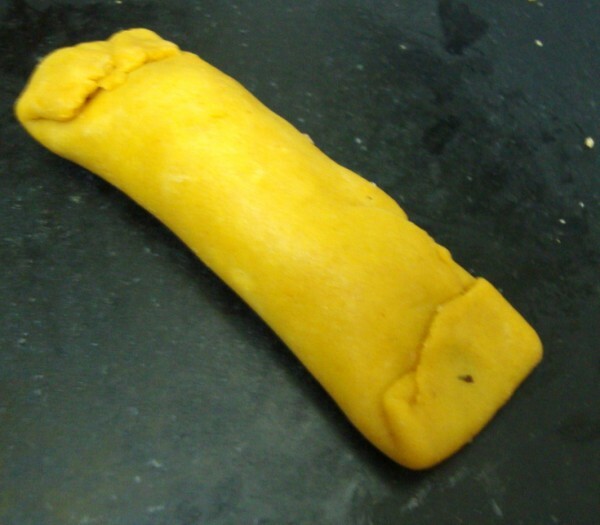 Starting from one side tightly roll over the stuffing. You can do this two ways. You can either flip both sides over each other and close tightly. else you can roll and flatten on all sides. Make sure the openings are closed on all sides. When the oil is hot, deep fry these rolls and cook on both sides. Drain when it is done. 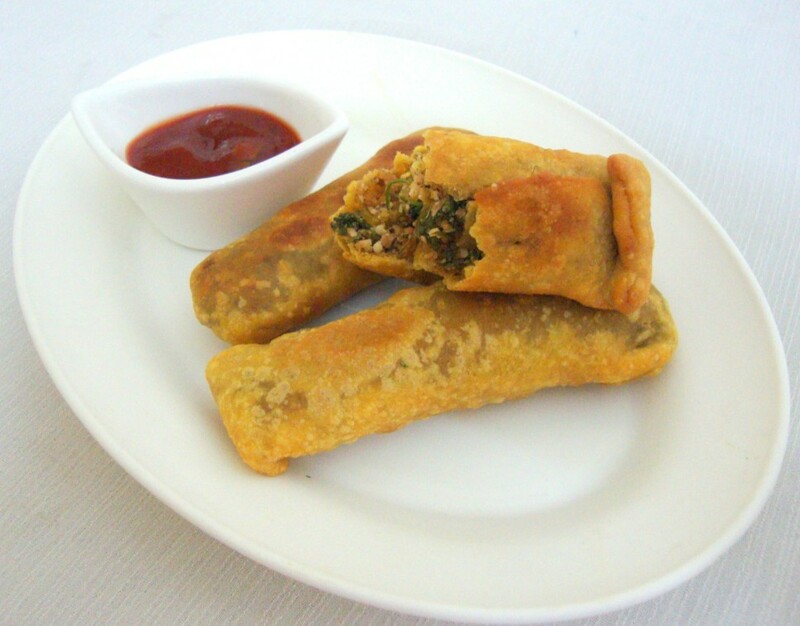 Serve with chutney of choice like Imli chutney, Pudina Chutney. I served with Tomato Sauce, and we simply loved it. One recipe called for Ginger Green Chili paste, while other didn’t. I simply added both Chili – ginger paste and Chili powder also. The recipe calls for Sugar, which I didn’t add to the stuffing. Archana’s recipe calls for onions, which I completely overlooked. Since I didn’t add onions, it was good the next day too. Just heat it over tawa and serve. Today is the last day for BM group 1, will be starting the group 2 tomorrow. To all my ICC members, please link your Pudachi Wadi post to Mr. Linky. I enjoyed the challenge Valli. Thanks for choosing these. I see you have made the rolls really long (compared to mine) and they have been uniformly fries too…no bubbles and such. I need to be more patient to avoid such I guess! The rolls were so tasty. These rolls are so new to me and I enjoyed preparing these. Thanks a lot Valli for teaching us a new snack. I am yet to make it!! But it is only 5:35 am in my part of the world and have plenty of time…the only unfortunate thing about making it today is the weather… Perfect weather for a deep fried snack but a terrible day for the photo session, as we have rain and mostly clouds in the forecast for most of the dayIt is raining heavily right now. Yumm, feel like having those crispy wadis,i'll be posting mine tonite..thanks for this wonderful challenge Valli,loved it..
loved the wadi's. thanks for choosing this for the challenge. I have posted the link. Enjoyed the challenge and this new recipe. Thanks! 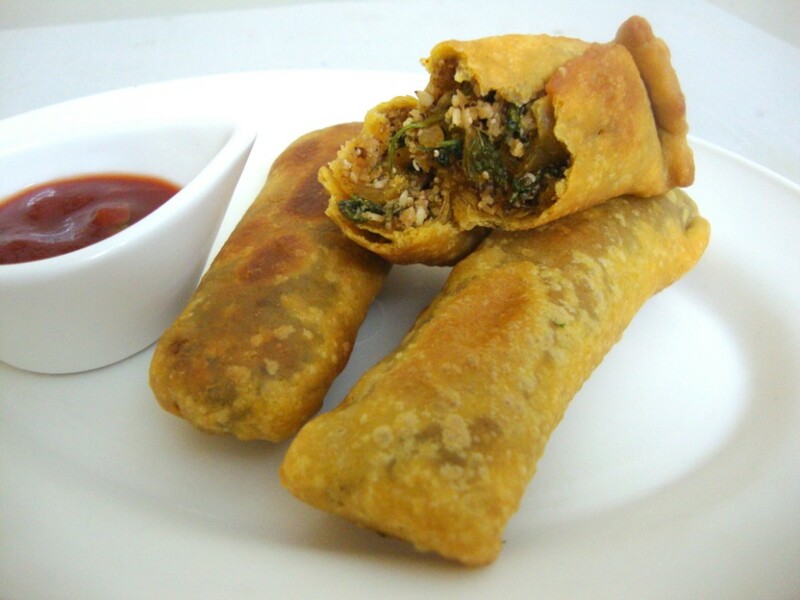 Those coriander rolls look so crunchy and wonderfully delicious! The Wadis look perfect and tempting Srivalli.That's such a great fun to do.Can I participate in this wonderful event ? Ooooooooooh !!! Yum, with all the BM cooking, I didn't get time to cook this, hoping to be able to make it. We really enjoyed this month's challenge Valli. What's not to like about deep fried besan and coriander, a little time consuming but really worth it at the end. Thanks for choosing an interesting dish and looking forward to next month's challenge. Your wadis look crisp and yummy. I finally did it… though with just hours to spare..but still. Loved this recipe. 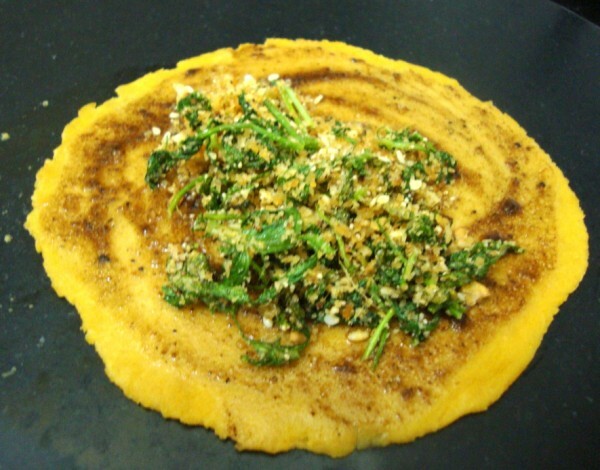 Am so glad to add this recipe to my blog!! Never heard of such a dish before. They look sooo tempting! Bookmarking it! Valli, I had left my opinion about the 2 dishes(Muffin and Halwa) a couple of days ago. Check it out when you have time! Thanks Valli. 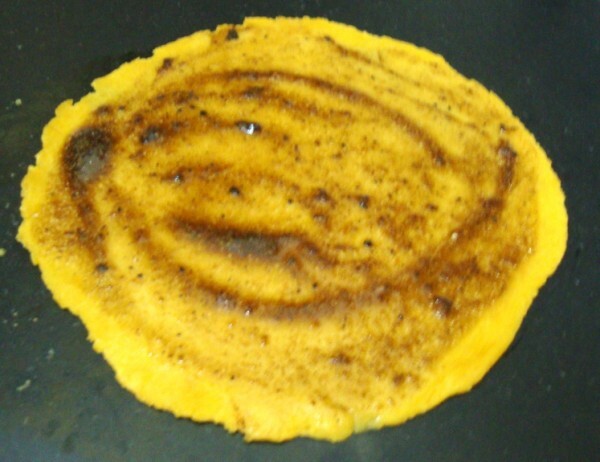 We enjoyed this snack from Maharashtra. Just posted n linked mine. Crispy and yummy! Love your pics! so perfectly done and looks so yummy !! Definitely a recipe worth the effort–thanks for choosing this one, Srivalli! 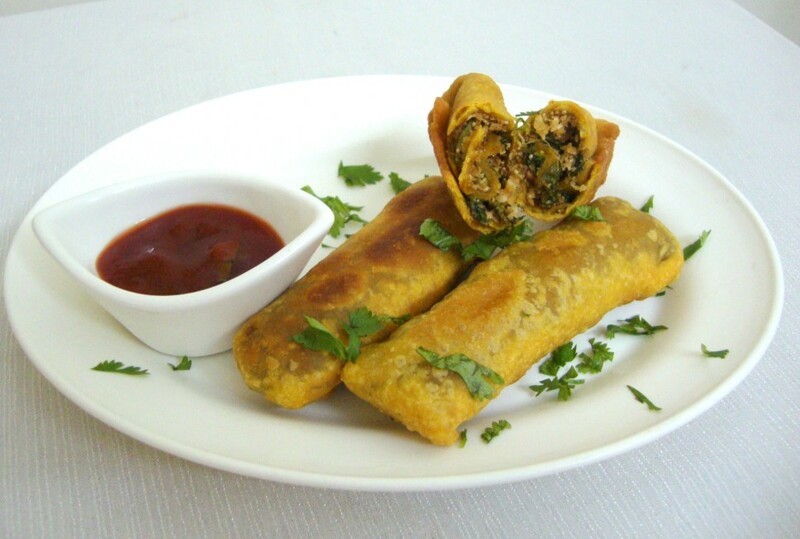 Srivalli, I prepared these rolls today for evening snack and we liked it a lot.A totally new recipe to me and really enjoyed making it.Though it seems tough, the recipe was quite easy to fix. NOT ABLE TO OPEN PRIYA AND SUMA'S BLOGS, PLEASE LET ME KNOW ARE YOU ABLE TO OPEN IT? I enjoyed making this dish this time. Love your color.